Victoria Beckham was named the People’s Fashion Icon at the 2018 People’s Choice Awards held at Barker Hangar in Santa Monica, California, on Sunday evening. While we think the singer-turned-fashion-designer is the rightful recipient, we can’t help but cringe at the fact that she was awarded for being stylish while wearing shoes that were way too big for her. VB wore the strapless version of her own Victoria Beckham ‘Solar’ pumps for the awards night. Her black-satin pumps do feature low-cut backs, but that wasn’t the culprit in the bad fit. There was clearly a large gap between Victoria’s heel and the back of her shoe. 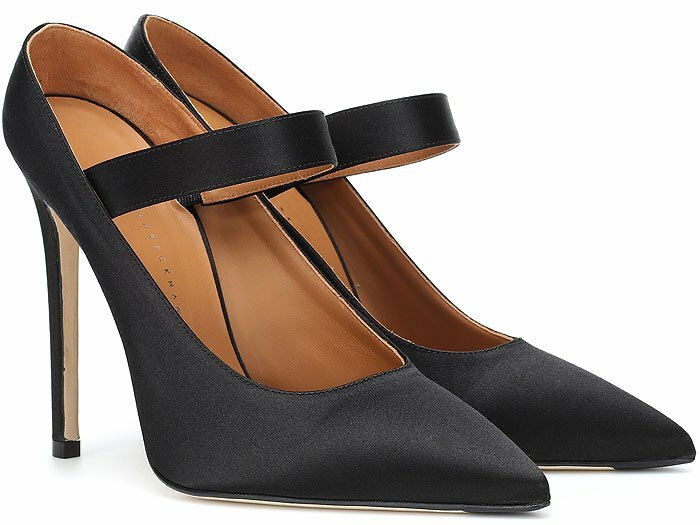 This elegant style has been crafted in Italy from lustrous black satin with a pointed toe, strap across the vamp, and low heel counter. Mrs. David Beckham used the ill-fitting shoes to punctuate a white lace camisole, a slightly oversized jacket, and slim tailored pants from her eponymous label’s Spring 2019 collection. We do love Victoria’s white-on-white ensemble but we think she could’ve switched the proportions. She could’ve gone with a tighter jacket paired with looser pants just to cover up those too big shoes. Don’t put up with too big shoes! We’ve got tricks on how to make shoes smaller. If it’s not possible to shrink them, we’ve also got tips on how to keep shoes from slipping off your feet while walking.